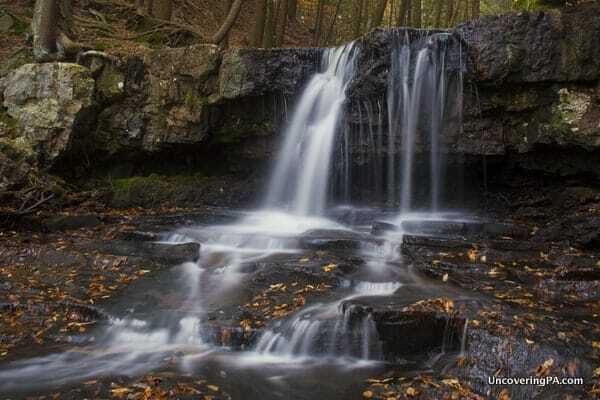 Hidden away in the Endless Mountains of Pennsylvania are dozens and dozens of breathtaking waterfalls. However, many of these waterfalls either require long hikes or are located on public property. 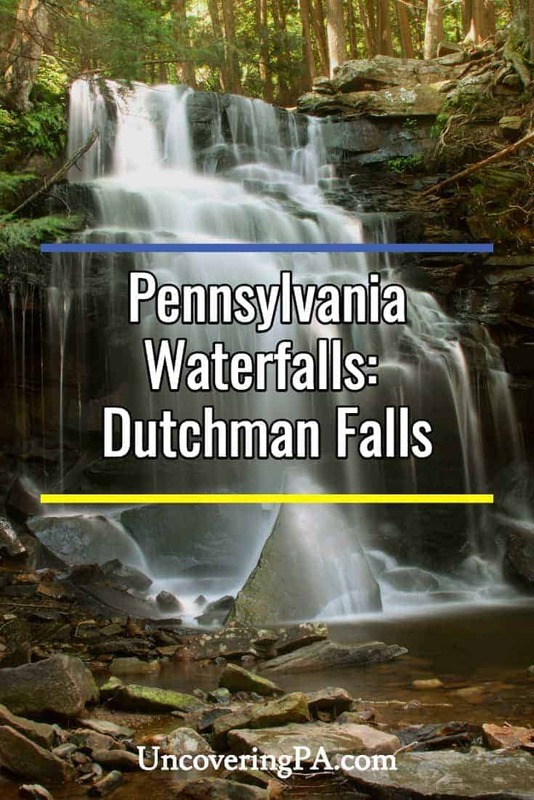 Fortunately, some, like Dutchman Falls, can be reached with a short hike. In reality, it’s a little weird to even call the trip to Dutchman Falls a hike. After all, it’s located less than five minutes from a very well-marked parking area. However, given that the path to the falls is narrow with difficult footing, it’s not exactly a simple walk to get there. 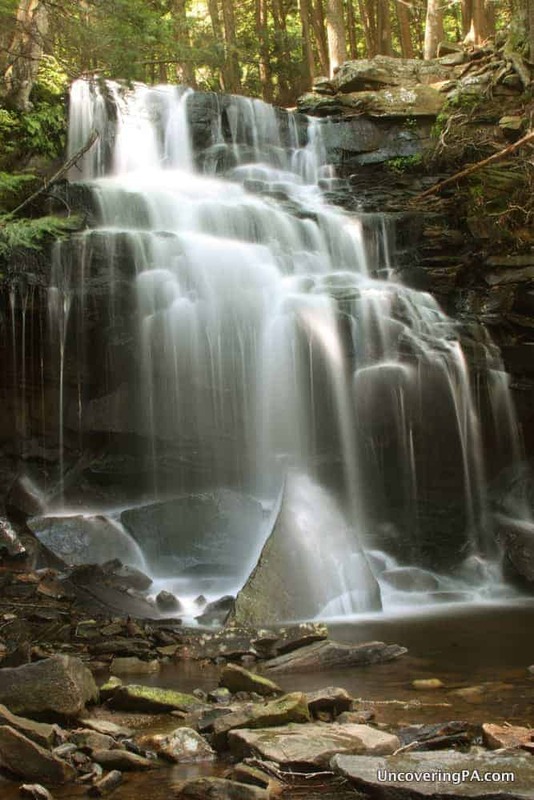 Dutchman Falls is a beautiful waterfall in Sullivan County’s Loyalsock State Forest. 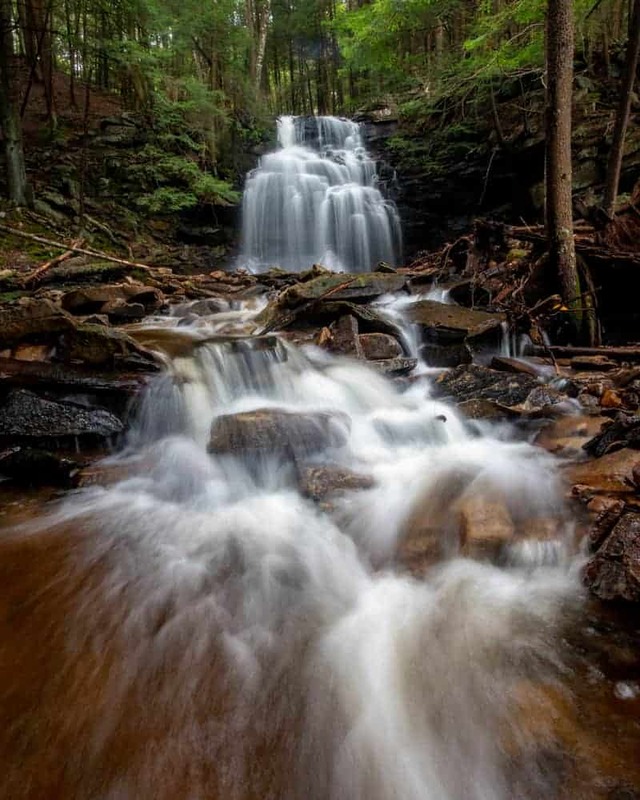 Dutchman Falls (known at one time as Amber Falls) is located just steps from one end of the Loyalsock Trail, a 60-mile trail that runs through Sullivan County and Lycoming County, passing many great waterfalls like Rode Falls. While the waterfall can be heard from the trail, it can’t be seen, so you’ll have to go off-trail to check it out. Hiking down the very steep and sometimes slippery hill, you’ll first encounter the upper portion of Dutchman Falls. This waterfall is only about seven feet tall, but makes up for its lack of height with a beautiful cascade. In fact, from a photography standpoint, I actually like this part more than the lower falls. The upper portion of Dutchman Falls is quite beautiful. The lower falls are located about 20 feet downstream of the upper falls. In fact, when you are checking out the upper falls, use extreme caution as one slip could prove to be quite dangerous. Getting down to the lower falls is a bit trickier than getting to the upper falls, The hillside here is much steeper, and there are fewer trees to support your descent to the base of the falls. However, once you reach the base of the falls, you’ll be greeted by a beautiful, 25-foot tall waterfall. This waterfall is quite striking, but unfortunately, there are some waterfalls that never look their best on camera. For me, Dutchman Falls is one of these. Looking upstream at Dutchman Falls while standing knee-deep in Loyalsock Creek. 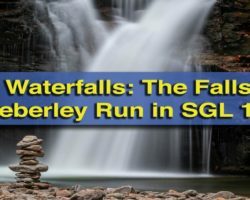 I’ve visited this Sullivan County waterfall on two occasions, and while both presented great conditions for photography, I’ve yet to take a photo of this waterfall that I really liked. So, please trust me when I say that Dutchman Falls is much more spectacular than it looks in this article. The waterfall is only about 50 feet upstream from where Dutchman Run meets Loyalsock Creek. This creates a rather spectacular setting, perfect for a bit of wading during the summer months. A side view of Dutchman Falls. Dutchman Falls really is one of Pennsylvania’s most beautiful waterfalls. However, since it doesn’t come across well on camera, visiting it is a must to fully appreciate its beauty. Another look at Dutchman Falls. 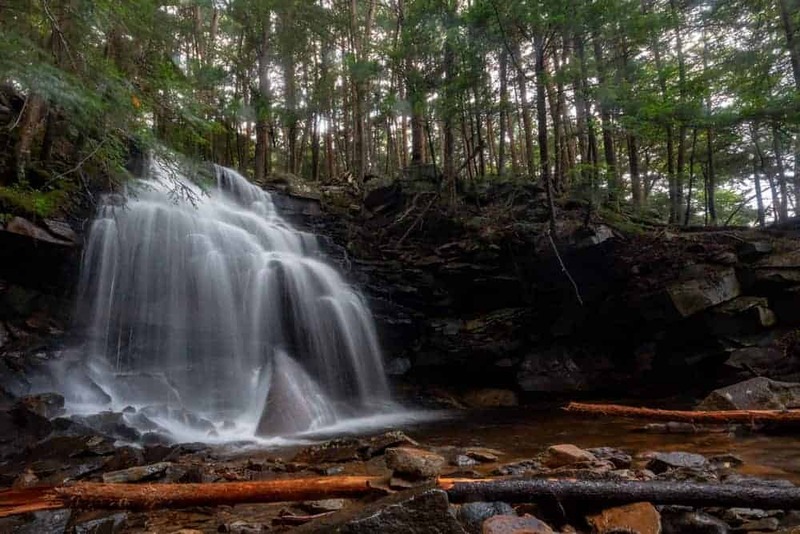 As I stated at the beginning of the article, Dutchman Falls is located only about five minutes downhill from the eastern end of the Loyalsock Trail. There is a very large parking area here, complete with bathrooms, making this one of the easier waterfall parking areas to find. If you are using a GPS to find the parking area, you can use the following coordinates: 41.447797, -76.453414. The parking area appears to be along a road called Mead Rd, though there is no official address to use. 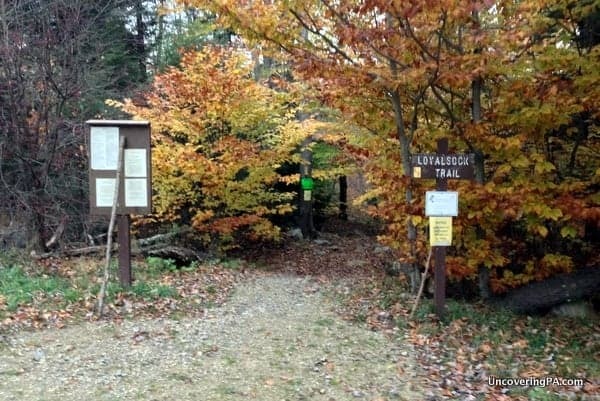 The Loyalsock Trailhead is also where you need to go to get to Dutchman Falls. From here, it’s a rather steep and rocky .1 mile trek down to a flat and wide rail trail (Don’t worry, you can’t possibly miss this). When you reach the rail trail, you’ll see a sign pointing you to the left to visit the Haystacks. Kindly ignore this sign and walk right past it, down the hillside. 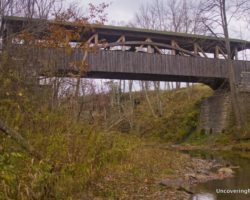 There is a good chance you’ll be able to hear Dutchman Falls from the rail trail, but if not, you’ll be able to see and hear it on your right in just a couple hundred feet. 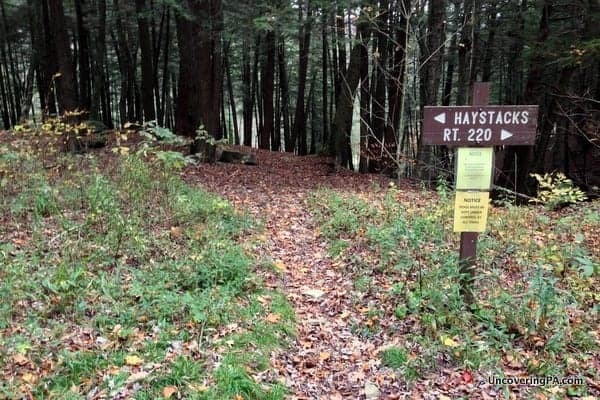 Walk past the Haystack sign and you’ll come to Dutchman Falls in just a few hundred feet. Once you’ve had your fill of Dutchman Falls, I’ve heard good things about the Haystacks, which are another 2-2.5 miles one way. However, I’ve never taken the time to make the relatively easy trek to see them. If you are interested in more information, the signage outside the trailhead bathroom has some interesting information on their geology and history. When you are ready to return to your car, be aware that following the trail back up the hill can be tricky. I managed to completely lose the trail on my last ascent up the hill, mostly because the autumn leaves and the sunset made it hard to find the narrow path. Should that happen to you, just head straight uphill, keeping the traffic noise on your left. There isn’t any way you can avoid either the road or the parking lot. A photo from my first visit to Dutchman Falls in August 2013. Surprisingly, there was great water flow for the middle of the summer. 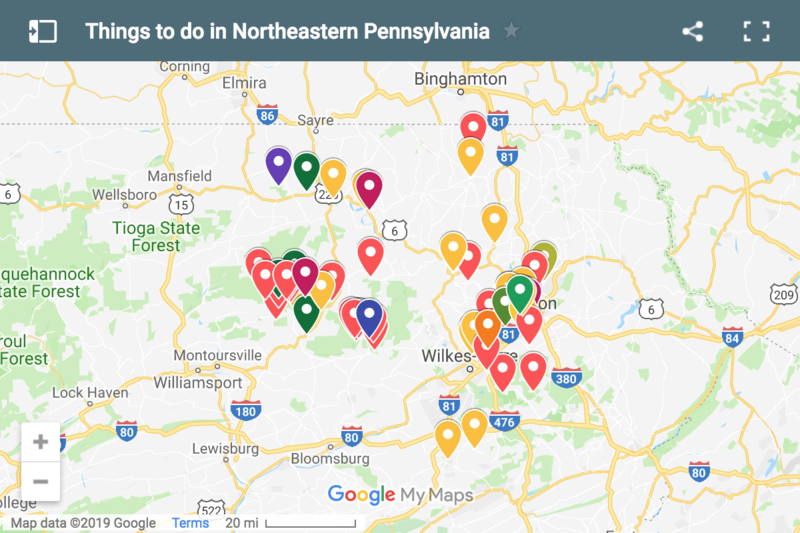 Scroll down to see the UncoveringPA map with a pin for the waterfall, which can be found at the following coordinates: 41.450091, -76.450794. Want to see more great waterfalls? 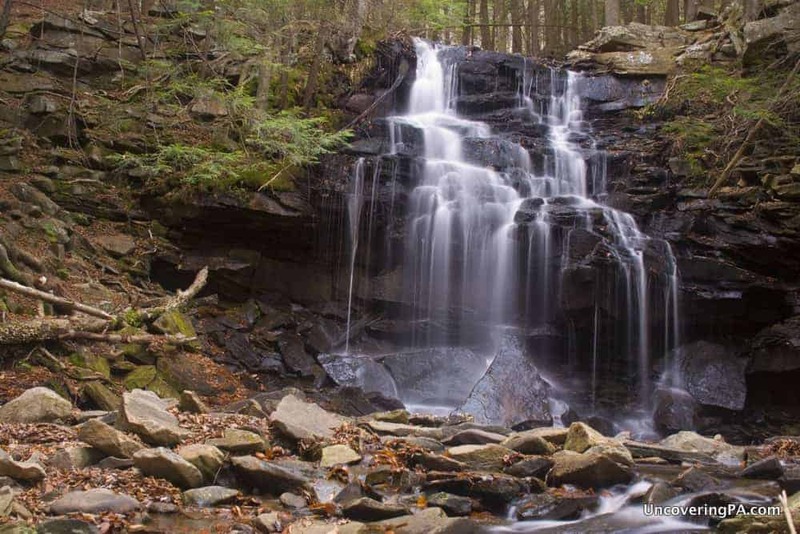 Visit the nearby Ricketts Glen Falls Trail, Sullivan Falls or the waterfalls of Heberly Run. 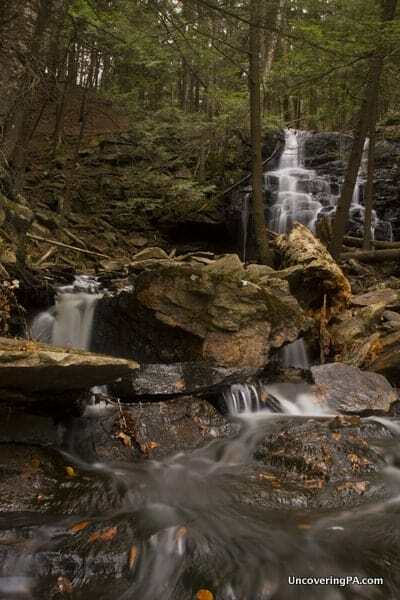 You can also check out our Pennsylvania Waterfall page and explore our top things to do in Worlds End State Park. 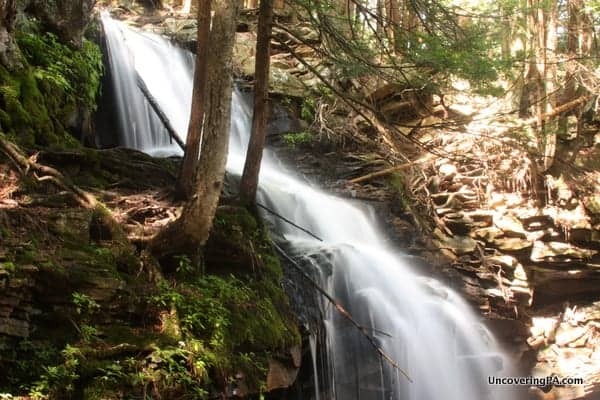 So, now you have discovered Dutchman but, have you found Lincoln Falls in Sullivan County yet? It the better of the two by far but, since the trail was covered by the power co-op it has become more difficult. Contact me if you have not been there but would like directions. 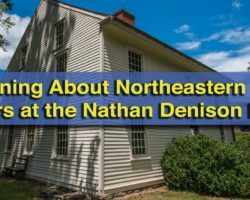 David Fuhrman….is Lincoln Falls still on private land? I haven’t been there in years, and the last time I was it was ‘posted’ [as hunters would say]. Love this place. Swam there many times. Many happy childhood memories. Lincoln Fall is privately owned and is posted for safety/liability reasons. 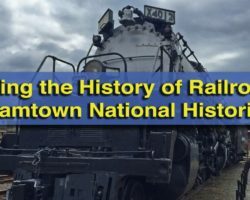 Lots of accidents in the past. Talk to our insurance company. Sorry. That’s a shame on all accounts, but I guess private owners have to do what they have to do thanks to people who like to sue for their own stupid behavior.